Uefa has opened a formal investigation into Paris St-Germain as part of its "ongoing monitoring" of clubs under financial fair play (FFP) regulations. European football's governing body introduced FFP 'break-even' rules in 2013, requiring clubs to balance their spending with their revenue. PSG more than doubled the world record transfer fee when they spent 222m euros (£200m) to sign Neymar last month. The French club made made a profit of 10m euros (£9.2m) on revenue of 520.9m euros (£389.6m at the time of conversion) in the 2015-16 financial year, according to the most recent figures published by Deloitte. Uefa's FFP regulations were approved in 2010 and the first assessments began the following year. The 'break-even' element states clubs can spend 30m euros more than they earn over a three-year period. 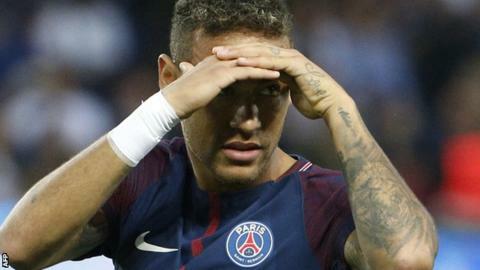 A Uefa statement said the investigation into PSG would "focus on the compliance of the club with the break-even requirement, particularly in light of its recent transfer activity".